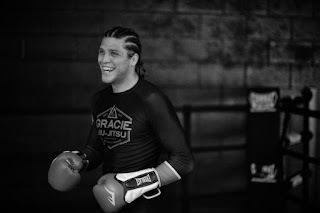 Brian Ortega is one of the hottest prospects in the featherweight division, and after winning the first 13 fights of his career (one overturned to a No Contest) he's finally getting that big opportunity he's been looking for. That's because Saturday night at UFC Fight Night 123, which takes place at Save Mart Center in Fresno, California, the 26-year-old American has the chance to take the next step in his career when he fights top-five featherweight Cub Swanson in the evening's five-round main event. It's a well-deserved opportunity for Ortega, who has defeated every opponent put in his path since becoming a professional MMA fighter in 2010. After winning his first six fights on the California regional circuit, Ortega was signed by RFA and defeated top prospect Jordan Rinaldi to earn a title shot against Keoni Koch, Erik Koch's brother. 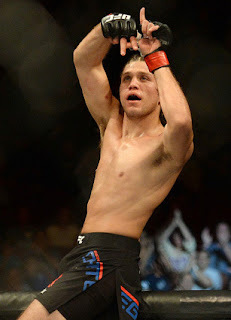 Ortega won the back-and-forth fight via split decision to win the RFA featherweight title and in the summer of 2014 was signed to the UFC. In his first UFC fight at UFC on FOX 12, Ortega showed everyone his vaunted Brazilian jiu-jitsu skills when he took Mike de la Torre's back and choked him out in the first round with a standing rear-naked choke. It was a tremendous UFC debut, but unfortunately Ortega tested positive for steroids and was stripped of the win and suspended for nine months. Ortega admitted to using PEDs and apologized for it, which has some merit to it, but either way he missed nearly a year of his career after getting caught. When he returned, the UFC gave him a step up in competition when he took on Thiago Tavares at UFC Fight Night 68. The two put on a "Fight of the Night" performance, with Ortega taking over the fight late in the third round and finishing Tavares with brutal elbows. It was Ortega's breakthrough performance, and it earned him a fight against Diego Brandao at UFC 195. Once again after starting slow Ortega came through in a big way in the third round by submitting Brandao. The UFC then matched Ortega up against durable veteran Clay Guida at UFC 199, and Ortega once again won in the third round, this time by KO via knee. The victory over Guida pushed Ortega well into the top 15 featherweight rankings, and it earned him a matchup against Renato Moicano. After a tough first two rounds, Ortega became the first fighter in UFC history to win four straight fights by third-round submission when he tapped Moicano out in another "Fight of the Night"-winning performance. The victory bumped Ortega up into the featherweight top five in the UFC, and the UFC responded by giving Ortega his first main event this weekend at UFC Fight Night 123 against Swanson. It's a tough fight for Ortega, albeit a winnable one. Ortega will have an advantage on the ground against Swanson and he's shown underrated striking, great cardio, and a solid chin as well. Plus, he has the undefeated aura about him. On the other hand, Swanson is on a four-fight win streak, has a ton of experience, and will have the striking advantage. On paper this is a great fight that the UFC matchmakers set up, and the odds have it as a near Pick 'em. Regardless of who wins, it's going to be a great fight. But for a featherweight division that is desperate for new contenders to feed to champion Max Holloway, an Ortega win would be massive. Brian Ortega has a big opportunity this weekend at UFC Fight Night 123, and let's see now if he will run with it. He has shown tremendous submission skills, terrific cardio and a huge heart in his career, and now he'll face a tough test when he takes on the experienced, durable vet Swanson. It's a great fight and the fans should be thrilled the UFC booked it, and now it's up to the fighters to perform and see what happens. But ideally, Ortega wins the fight in impressive fashion and calls Holloway out. We'll soon find out.